Traditional poetry of the Siberian Yakut, translated by John Harold Leavitt in Poetry and Prophecy: the Anthropology of Inspiration. By land Russia is largest country in the world, though more than three-fourths of that massive territory is accounted for by what is often thought of as the desolate, frozen expanse of Siberia. Distinguished by extremely low population density and possibly even lower temperatures (Oymyakon in the Sakha Republic is thought to be the coldest town on earth), Siberia is also rich in metals and minerals, fish and forests, generously scenic beauty and an extraordinary natural defense system in the form of vast mountain ranges and coiling rivers which inhabitants have thought must illustrate a divine, protective intention surrounding them. It is for these unsurprising reasons that 16th century Russian interests steadily encroached eastward into the then autonomous region of Siberia Khanate, establishing army forts, trading posts and towns deeper and deeper into the territory. By the mid-17th century, Russian development in Siberia extended all the way to the Pacific, but from the seat of Russian power in Moscow, there was still little known about the area. 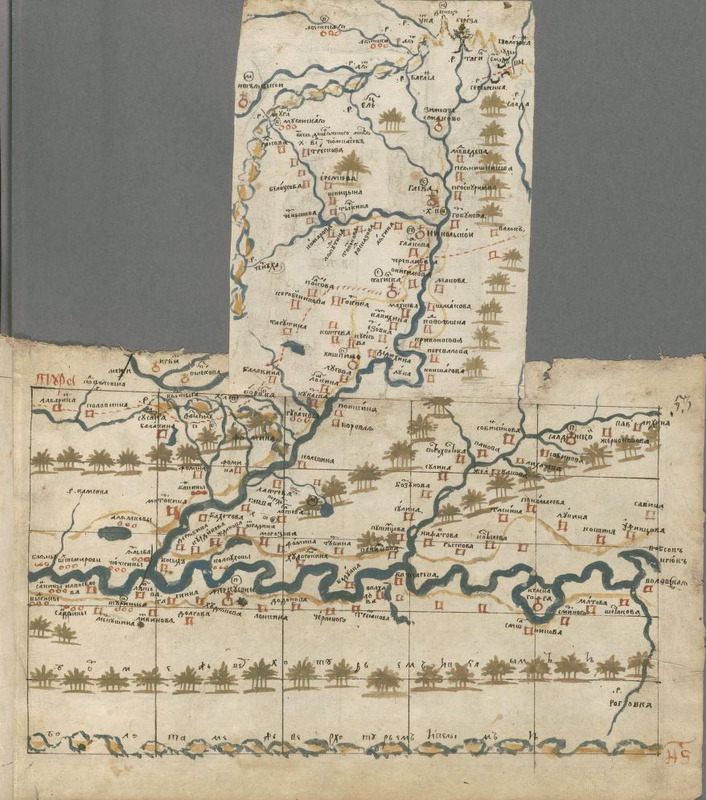 By all reports there were at that time no maps of Siberia in Russia and so, seeking to collect knowledge and understanding of their extended interests in the area, late in the 1600s, the Siberian Court Office of Moscow ordered the production of a number standardized settlement maps. Cities and towns were to be represented and notes made on surrounding features of the land, particularly their situation on rivers and the native settlements within certain proximities. 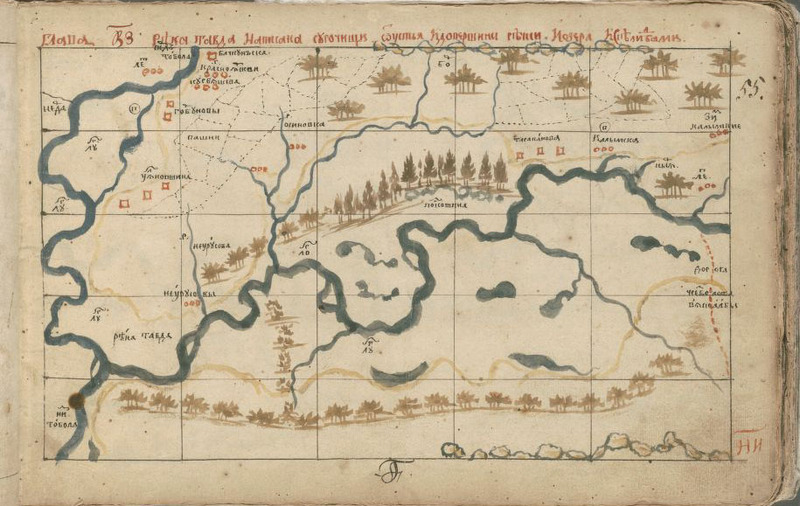 Throughout Siberia, land-surveyors and draftsmen were recruited to do work on this massive project, but one notable man in Tobol’sk, Semën Ul’ianovich (alternately, Semyon Ul’yanovich) Remezov, would emerge as the primary cartographer of the region, creating, by the estimate of historian James R. Akerman, some 80 percent of the surviving Siberian maps of his century. Akerman’s biographical sketch of Remezov tells a compelling story: a low-level government administrator who brought creative energy to his census registry work, compiling ethnographic data in the depths of Siberia, a “restless” intellect who contributed much to his city of Tobol’sk, and an artist who would capture a dynamic sense of Siberia on page after page of beautifully rendered maps. Working at the request of Moscow, Remezov drafted a number of maps of the Siberian territory, some of which he was seemingly reluctant to part with, variously promising that he had sent or would be sending them directly to his employers. 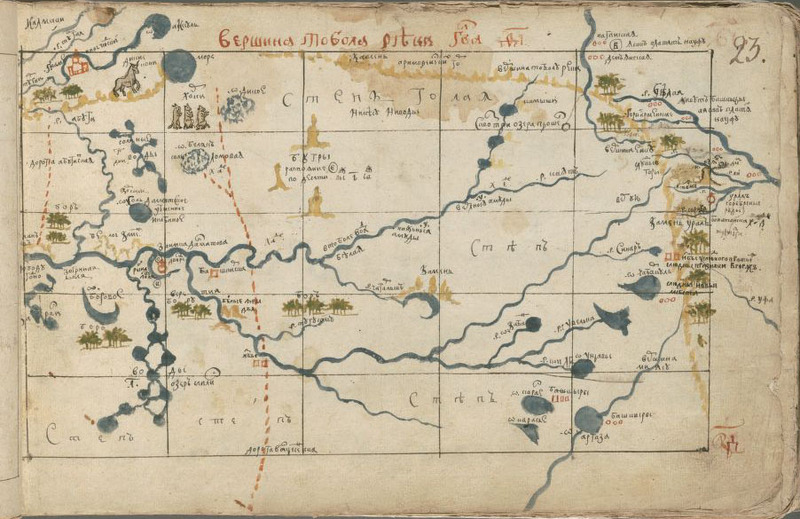 Among these works, was a crowning achievement in the Khorograficheskaya Kniga, the cartographical sketch-book of Siberia that Remezov completed in final years of the 1600s. The manuscript was created on standardized pages and bound together in a neat volume, though throughout it Remezov’s rendering of the land flies off of the pages in the form of glorious fold outs, sprawling rivers and outlying territories on variously sized pieces attached to the primary manuscript pages. 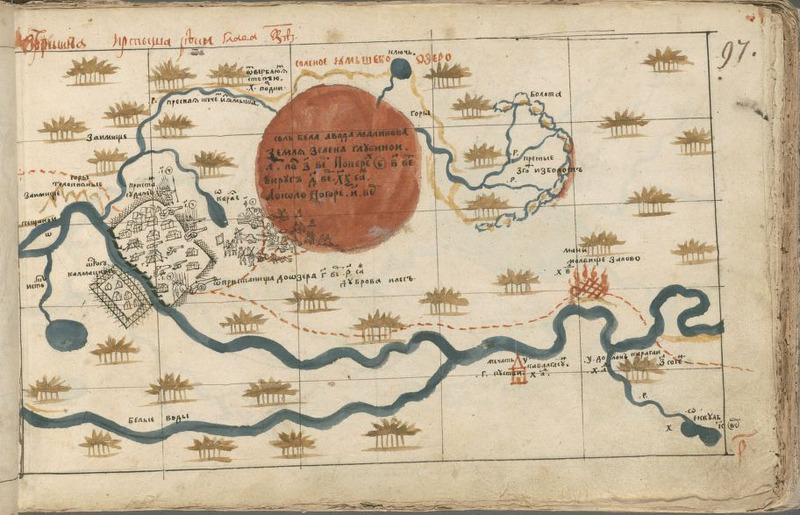 Many years later, this work would captivate Leo Bagrow, a Russian cartographic historian who, during the tumult of the Revolution, removed the maps from Russia to the United States. Bagrow, who founded the journal Imago Mundi, seemed to greatly admire Remezov’s work and published the first reproductions [link requires JSTOR access] from Khorograficheskaya Kniga in his journal in the mid-1950s. Even from these grainy and blurred black and white copies, however, the style and expression of Remezov’s work was irrepressible. 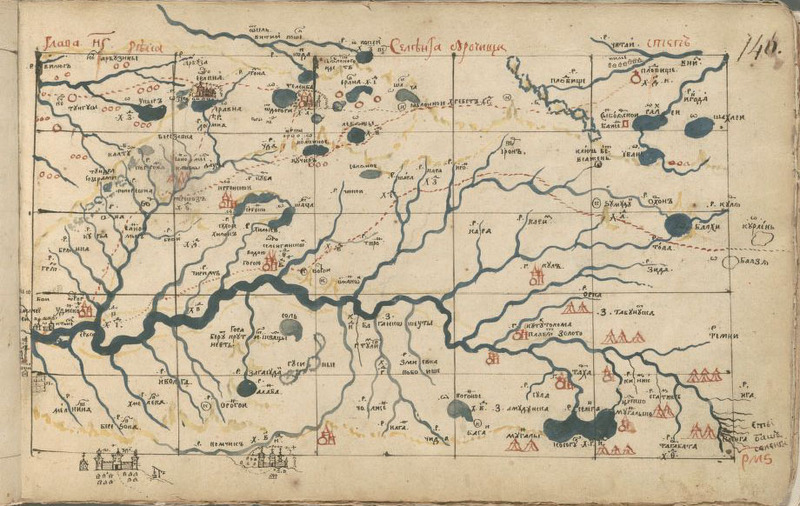 In his analysis of the work, Bagrow notes that, as was the style of the day, Remezov’s maps were constructed from land-surveys based around observations of the river systems, and the rivers are truly constant characters throughout the work, but as strong a sense of Muscovite cartographic tradition in Remezov’s work is, the maps are plainly marked with idiosyncratic detail. Indeed, there are moments in the maps that seem almost like whimsy: expressively inked animals, neatly rising turrets and towers, smatterings of tents, diverse, sloping clumps of trees and mysterious patches of forest, meticulously penned notes curving along the landscape. The Bagrow collection was given to Houghton Library by Curt H. Reisinger in 1956. The entirety of Khorograficheskaya Kniga (MS Russ 72 (6)) is now available in beautifully captured digital form, bringing this hundreds of years old vision of a vast land to new light.